A river becomes polluted little by little, until it’s suddenly completely toxic. The film examines Stone’s power over American politics — from Richard Nixon to Donald Trump — with a fascinating look at a shadowy figure’s four decades of influence. The title comes from the phrase uttered by politicians and presidents who understand that Stone “gets” polling and people. In the period after the film was released, Google searches for Roger Stone spiked. The documentary been dissected in analysis from the New York Times, the Atlantic and many others. Stone completely relishes the attention, both positive and negative. He frequently shares links to the documentary with his 210,000 Twitter followers, quoting descriptions such as “an energetic tour guide and three-ring circus of one” from the New York Times or “ultimate political trickster” from CNN. Is he being ironic? Does it matter? One of Stone’s Rules, as outlined in the documentary, is to win at all costs. Just get more votes than the other person, no matter what dirty tricks it costs. There’s a related corollary: Ratings at all costs. To some degree, the news has always been about live entertainment. In 1985, Neil Postman cautioned about a world centered around TV culture in his book “Amusing Ourselves to Death.” Postman wrote that we shouldn’t congratulate ourselves too much because society didn’t look like George Orwell’s 1984 in the year 1984. Instead of Orwell’s dystopian vision, we are more like Aldous Huxley’s “Brave New World,” according to Postman. In this view, we’ve undermined our political discourse with shallow, trivial, TV-centric entertainment, dulled and lulled to sleep by the consumption of endless imagery. So was Postman just a pompous blowhard that hated popular entertainment? Not exactly. Postman isn’t against entertainment per say, and he states that “bread and circus” has been with us long before the electronic age. Rather, he was warning about show business taking over all sectors of media, even the ones where it really makes no sense. For example, Postman pointed to discussions where discourse is supposedly elevated: Sunday morning news shows. But on television, talking heads were expected to respond and debate immediately. They never responded “Let me think about that” or “I don’t know” or especially “What do you mean when you say…?” That’s just not good for ratings. That was more than 30 years ago. Today, that style of news programming is more ubiquitous than ever. Postman didn’t live to see the rise of Fox News or MSNBC where partisans, spokespeople and candidate surrogates appear on news talk shows simply to deliver a monologue. You don’t even have to watch these shows to see performance-as-news. Your news feed teems with headlines like “Watch this Spanish lawmaker utterly destroy her loathsome colleague” or “Watch this pro-life teen destroy Teen Vogue over their post-abortion ‘gift guide.’” Those are real headlines I found when I searched keywords “watch” + “destroy” on Twitter. In this media culture, each side sees what they want to see, even in the same interviews. When Megyn Kelly interviewed Newt Gingrinch before the election, the reaction from each partisan group couldn’t have been more different. “RETWEET if you haven’t watched BIASED Megyn Kelly since her disgraceful interview with Newt Gingrich before the election! #MAGA” stated one tweet with 1,800 retweets. “Apparently, Newt Gingrich now thinks Fox has a liberal bias. Wow. The right is having a nervous break down in real time,” said another tweet with 1,300 retweets. In many ways, Postman was prescient about TV culture, which he really defined as the culture of quickly moving, distracting images. When he wrote this book, he said the average length of a shot on network television is only 3.5 seconds. Now 3 seconds counts as a “view” in Facebook video metrics. We have made TV culture portable and ubiquitous. The average person spends 10.7 hours per day — as my Jesuit friend Joe Simmons pointed out — in front of some sort of screen, be it a TV, computer or iPhone. Our multimedia consumption has hit an all-time high. In Postman’s day, the president was a Hollywood star. Today, the president is a reality TV star who thrives by improvising and saying whatever comes to his mind in front of the camera. As he reminds Americans, he gets ratings. Assuming Postman is right, what are the consequences of a ratings- and metrics-based culture? The metaphor Postman uses is that a river becomes polluted little by little, until it’s suddenly completely toxic. You can’t help but nod along and see recognition in every sentence when reading Postman’s book. We are now aware of the issues that come along with toxic TV culture and ratings at all costs. But now along we TV, we also have Netflix and on-demand streaming, social media and hyperpartisan news sources. They’re all looking to metrics for success. 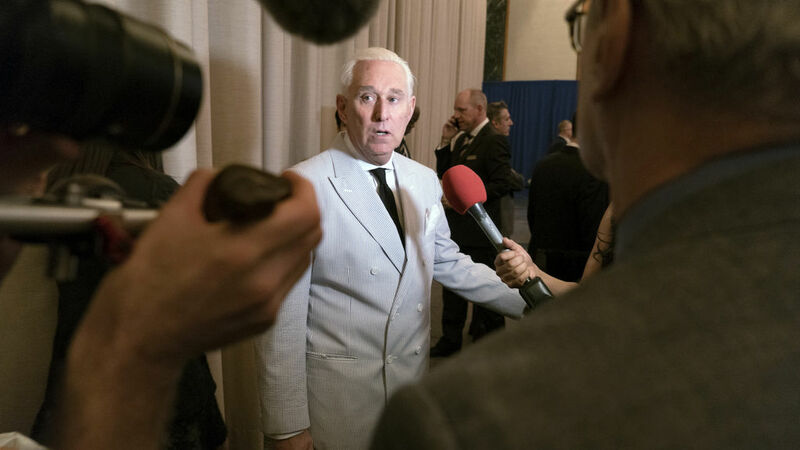 “This movie suggests that his most obvious talent is for self-promotion, one that’s been aided by the attention of the news media,” Manohla Dargis writes in the New York Times, talking about Roger Stone.